One of my favorite things about visiting Rome was the food... seriously, John and I were non-stop eating and every single calorie was worth it! As much as I loved the gelato, I must say that the fresh pasta was my favorite – pasta for dinner and pasta for dessert. And quite honestly, it was so delicious and fresh, that I will never eat dried pasta from a box again... it just ain’t worth the calories after you’ve had the good, fresh stuff. So, after returning home to the Motherland, John and I were on a mission to make homemade pasta. And sure enough, it worked! And it was so easy. AND, you probably have everything to make it in your kitchen right now! All you need... 2 eggs and 1 1/2 cups of flour. 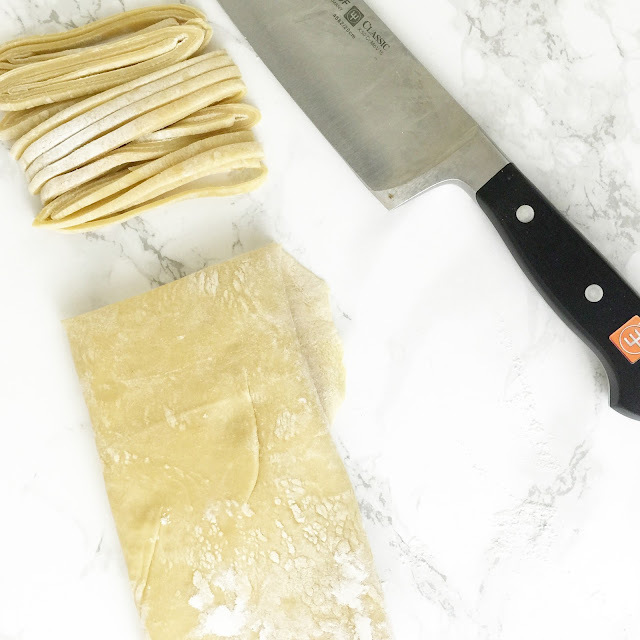 No pasta maker needed... just a little muscle for the dough (or a mixer if you’re fancy! ), a rolling pin (or a bottle of wine...), and a knife to cut the pasta. 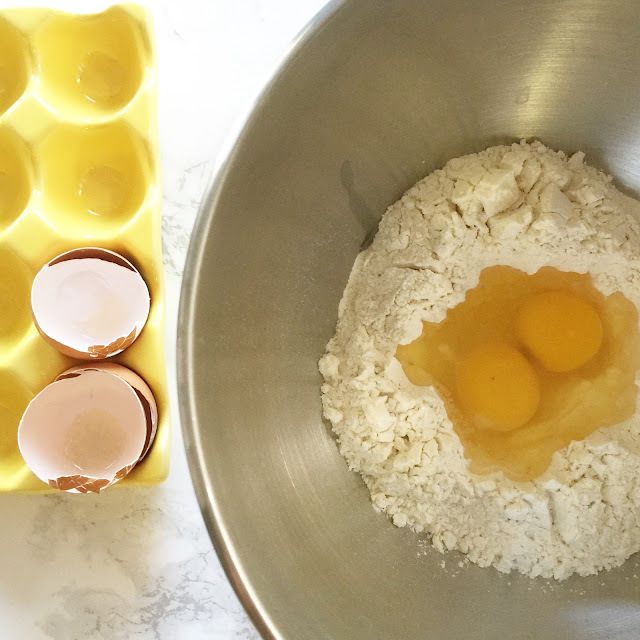 Simply put your flour in a bowl, hollow out a little hole in the center of the flour, and crack the eggs into the center. Using the dough hook attachment of your mixer, turn the mixer on medium speed, and leave alone until it starts forming the dough. It takes a bit of time, so be patient. DO NOT clean the sides of the bowl. 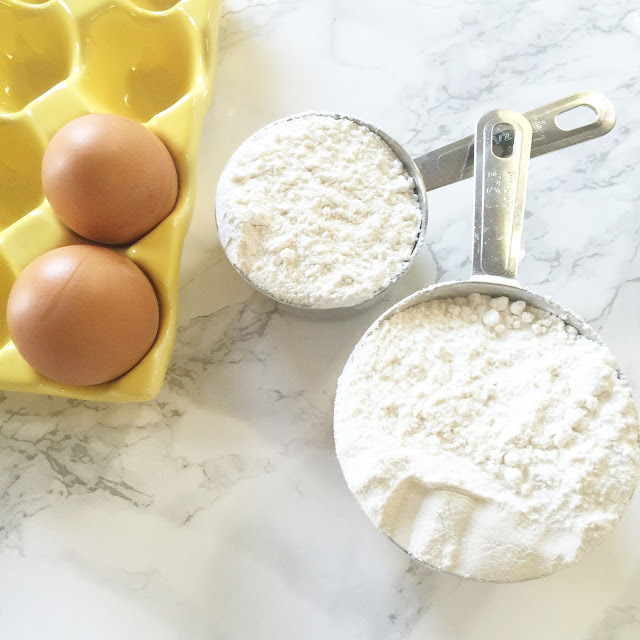 The dough will slowly pick up the flour, and if you attempt to “help” the process by incorporating the flour too quickly, the dough will not stick and end in crumbles. So resist the urge, and don’t interfere with the mixer’s magic. 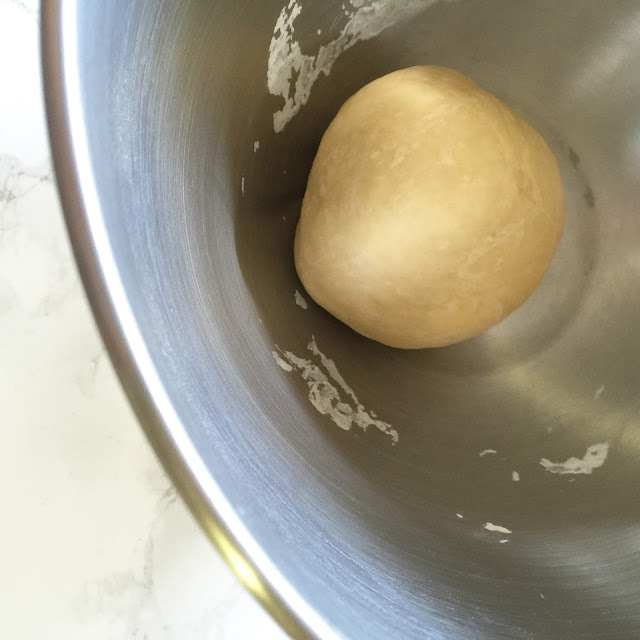 After your dough is mostly combined, knead the dough by hand a few times to get it nice and smooth. 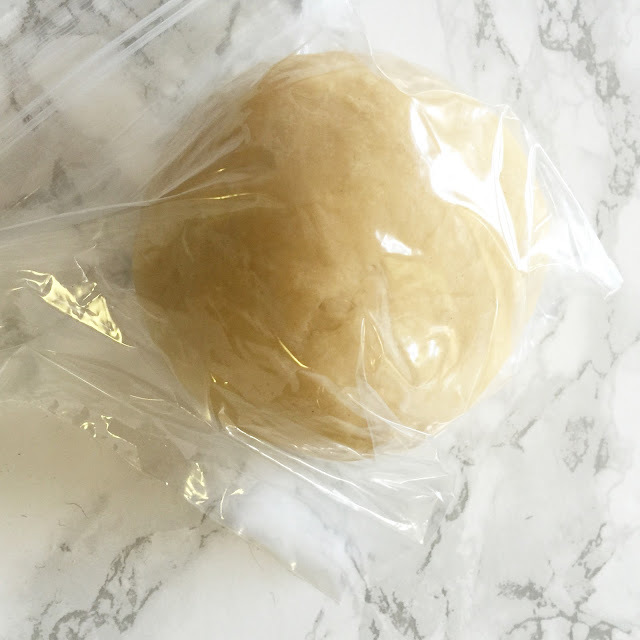 Place the dough into a baggie and refrigerate for 20 minutes. 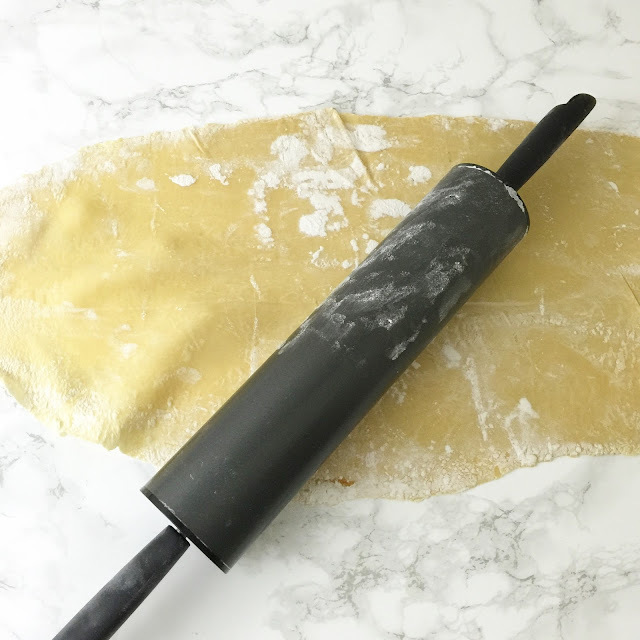 After refrigerating your dough, use a rolling pin and roll out the dough as thin as possible... like it’s almost going to tear thin! Once it is rolled out, fold the dough into little sections. Once the dough is folded, very thinly slice the dough to create the noodles. The thinner you can roll out the dough and the thinner you can cut it, the better! Once you have your dough cut, unfold the noodles... and tada! To cook, place the noodles in boiling water for 3 minutes. 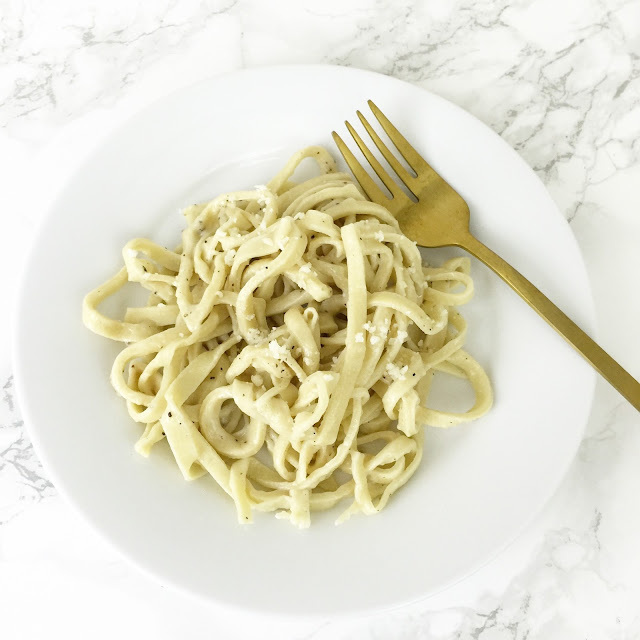 With our noodles, John and I made Cacio e Pepe (our favorite dish in Rome!). 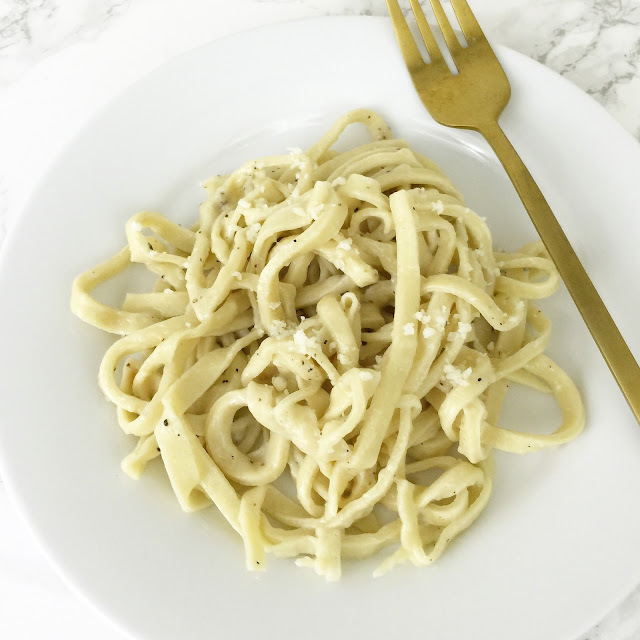 We followed this recipe (you only need pepper and pecorino romano cheese!). If you don’t have a mixer, follow this YouTube video to make the dough. Side note: You don’t make dried pasta by drying out fresh pasta... they are actually two different processes with different ingredients. 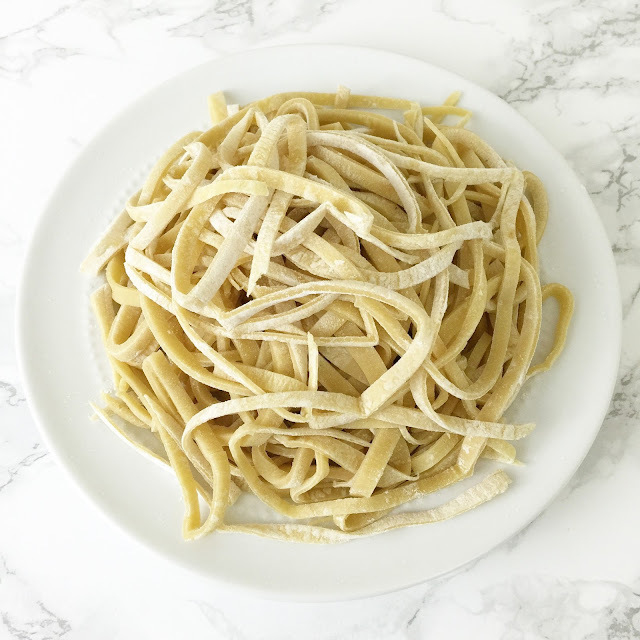 Also, depending on what you’re using the pasta for, dried pasta may be a better choice (chicken noodle soup, for example) because it will hold up better. But truly, take my word for it, once you try fresh pasta, your pasta life will never be the same! wow mouthwatering! I always thought making pasta would be super intense and time-consuming but you didn't make it seem too bad. might tackle this one day soon! This looks so good! 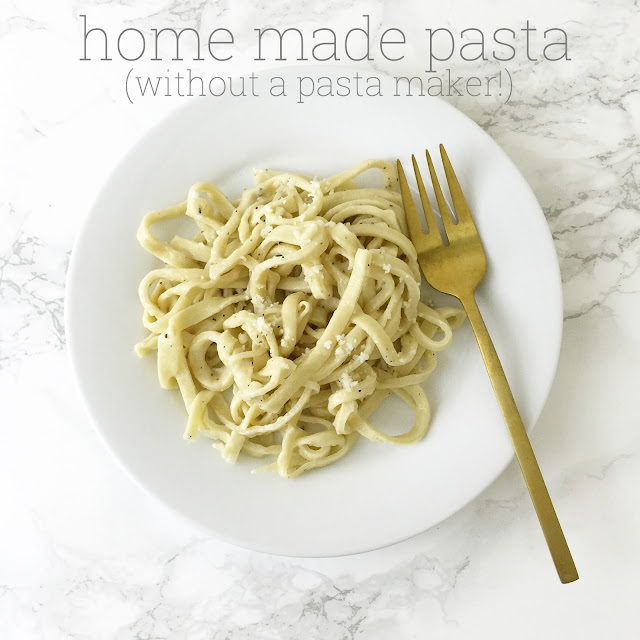 I never thought that homemade pasta would be easy to do but this doesn't look too difficult! I have been jonesing for a pasta maker attachment for my KitchenAid but now that doesn't seem to be necessary! I'm definitely trying this before I head back to work for the new school year. My dad lived in Italy for a couple of years and he is an amazing Italian food maker. I don't think he has ever made fresh noodles though. This is something I'm going to have to try out for him. Lisa, you are amazing! 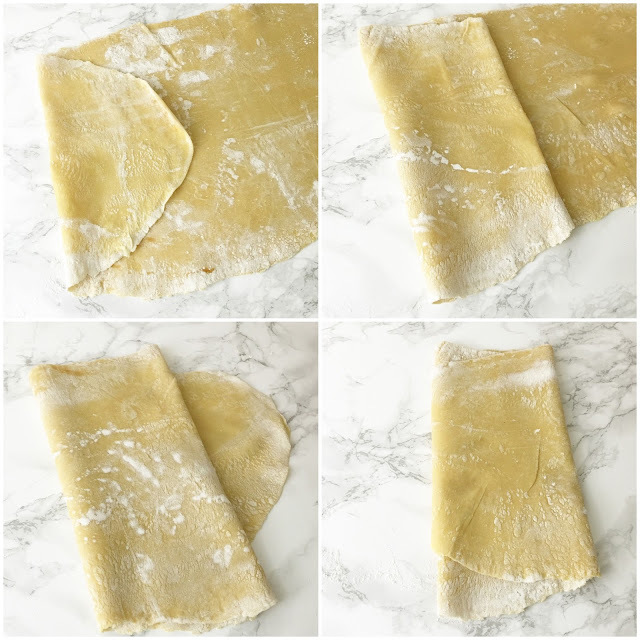 Homemade pasta from scratch sans pasta attachment/maker! Honestly, I'm in awe! I've always wanted to try fresh pasta--can't wait to try this out! I've always wanted to try making fresh pasta...but didn't have the pasta maker...but you make me want to do this! YAYYY!! I love this post! We feel the same way now that we have had the real thing, I can't wait to try this. No way! How is it so easy? I need to try this! LOVE you guys did this! Wish I had more counter space... but I just may have to get creative and attempt it on the dining room table ha.It looks fantastic! You are totally my hero. I will be your neighbor if I can eat this!!! Brava, Ragazza! Mi piace molto! Yum!! I've been making my own ravioli and tortellini for a few years now and you're right, there's nothing like fresh pasta! One year I dried out my noodles and gave them as Christmas present with homemade canned spaghetti sauce! Soooo good! I love your flatware too, very pretty! Wow, that looks so delicious and amazing! Wow this seems so easy (minus the muscles required to roll out the dough ;)). I'm going to have to try this one weekend!